A Latin American-inspired one-pot chicken and rice dish. 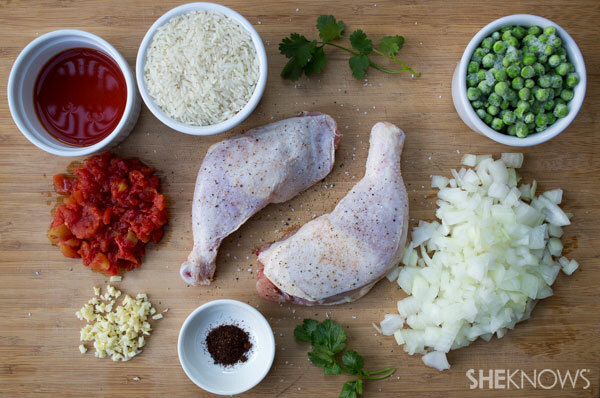 There are many ways to make arroz con pollo, a traditional dish of Spain and Latin America. This recipe is a fast and easy version my good friend’s abuela makes when she is in town. 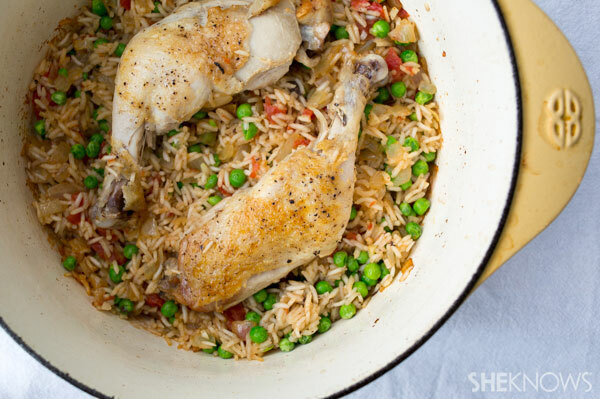 The chicken and rice cook together in one pot or skillet, which is both convenient and adds flavor. The ingredient list is short and, happily, consists of pantry and freezer staples like canned tomatoes and frozen peas. We enjoy it any night of the week, any time of the year and with all kinds of company. It’s versatile and is an often-requested meal that makes appearances on weeknights as well as special occasions. Preheat the oven to 350 degrees F. Coat the bottom of a large pot or skillet (with a lid that fits tightly) with oil over high heat. 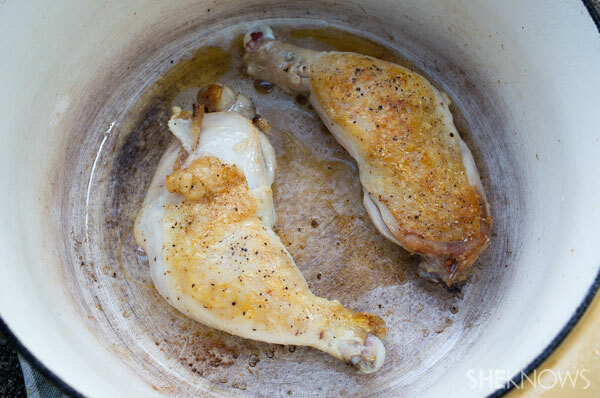 Generously season the chicken with salt and pepper, and once the oil is hot, add it to the pan. Sear until golden brown on one side, then flip and sear on the second side. Move the chicken to a plate. Reduce the heat to medium and add the onion, chili powder and a pinch each of salt and pepper. Sauté until the onions are translucent, then stir in the garlic and chopped tomatoes. Stir in the tomato juice and chicken stock. Turn off the heat, top with the browned chicken in an even layer, cover and move to the oven for 30 minutes. At this point the rice should be cooked and the chicken cooked through; otherwise, add a little more chicken stock or water, cover and cook until both are achieved. Stir in the peas and return to the oven, covered, for 3-5 minutes to thaw. Stir in the cilantro and either serve the whole chicken legs over rice or use a fork to shred the chicken and mix into the rice. Serve warm.